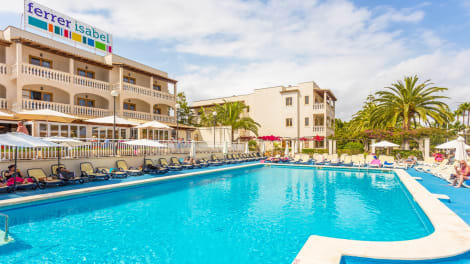 With a stay at Hotel Ilusion Moreyo in Son Servera, you'll be next to a golf course, within a 10-minute drive of Cala Millor Beach and Parish Church of St. John the Baptist. This golf hotel is 8.9 mi (14.3 km) from Caves of Drach and 11.3 mi (18.1 km) from Cala Agulla Beach. 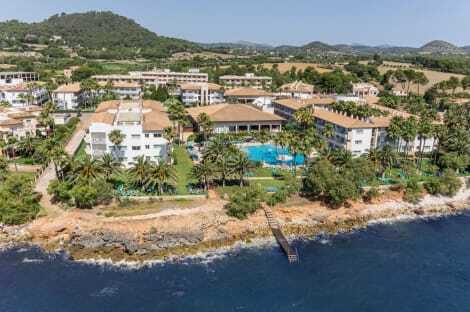 With a stay at Catalonia Del Mar - Adults Only in Son Servera, you'll be by the sea, within a 10-minute drive of Cala Millor Beach and Club De Golf de Son Servera. This 4-star hotel is 9 mi (14.5 km) from Caves of Drach and 11.4 mi (18.3 km) from Cala Agulla Beach. Be sure to enjoy recreational amenities including a sauna and a seasonal outdoor pool. Additional amenities at this country house include complimentary wireless Internet access, concierge services, and a television in a common area. Sports enthusiasts might make use of the tennis court and relax with a massage in the massage room, and everyone can enjoy the library and games room with billiards and table tennis. The hotel's classic guest rooms all come with en suite bathroom and a terrace with sea or mountain views. The snack bar provides an excellent place to relax with a drink or ice cream and features large televisions so that guests can follow their favourite sports. This is the perfect place for a sunny family vacation. Make yourself at home in one of the 83 air-conditioned rooms featuring flat-screen televisions. Rooms have private balconies. Complimentary wired and wireless Internet access keeps you connected, and satellite programming provides entertainment. Private bathrooms with showers feature complimentary toiletries and hair dryers. Make yourself at home in one of the 71 air-conditioned rooms featuring flat-screen televisions. Rooms have private furnished balconies. Complimentary wireless Internet access keeps you connected, and satellite programming is available for your entertainment. Private bathrooms with showers feature complimentary toiletries and hair dryers. This typical Majorcan property is located in Cala Bona Majorca, in the area of Son Floriana, near Cala Millor and Sa Coma. The hotel is housed in an authentic Majorcan residence, over 300 years old, which was fully restored in 2009. This establishment successfully combines modern amenities and historic ambience, to offer both business and leisure travellers an unforgettable stay. In addition to the 9 comfortable rooms, this air-conditioned hotel comprises a romantic courtyard and a terrace. Guests are welcomed to relax or take enjoy a swim at the outdoor pool with sun loungers and parasols laid out at the water's edge. lastminute.com has a fantastic range of hotels in Calla Bona, with everything from cheap hotels to luxurious five star accommodation available. We like to live up to our last minute name so remember you can book any one of our excellent Calla Bona hotels up until midnight and stay the same night.